For all of the cliche popular images of the scary, hardened bikers – I feel like I must exist on the opposite end of the spectrum. When I’m out and about on my bike strangers approach and talk to me all the time. So much for a tough image. I don’t think that I have an exceptionally friendly face or anything. Besides, most of the time people seem to want to talk to me when I still have my helmet on. No one talks to me when I drive my car anywhere. Is it the same for you? 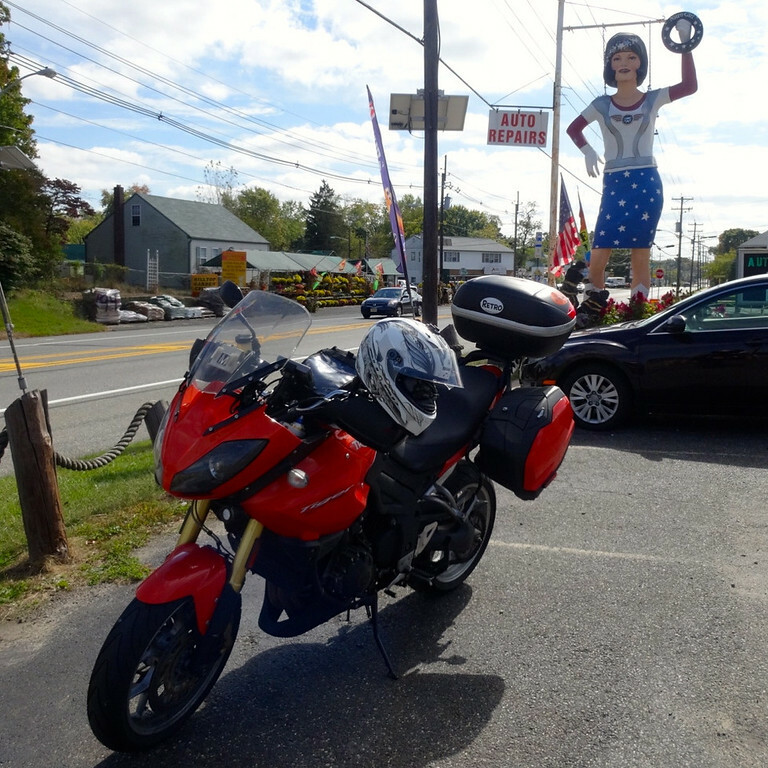 Just last week while traveling through New Jersey, I stopped off to snap a picture of Nitro Girl. She’s the coolest Uniroyal Gal around. 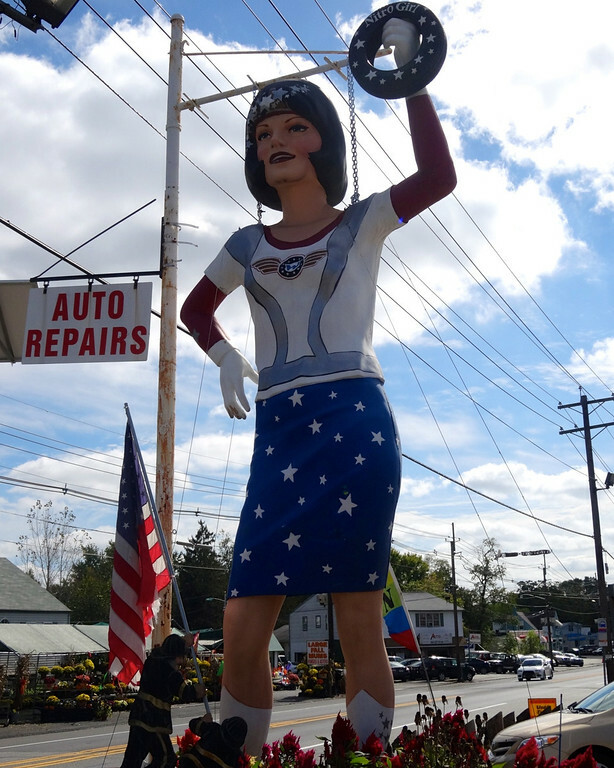 She stands outside of Werbany Tire Town in the town of Blackwood. Jackpot! Thanks, helpful stranger guy! Interesting – The website lists the bobbleheads at $25. The fella in the shop charged me $10. Did I get a deal because I looked like a hobo or have they been marked down? Who marks down Nitro Girl?! My husband says I look like a total badass with all the black leather chaps and jacket riding a Harley – and then I give a big goofy smile and start talking. The biker persona goes out the window! Out comes the middle aged nurse just looking for some wind therapy! 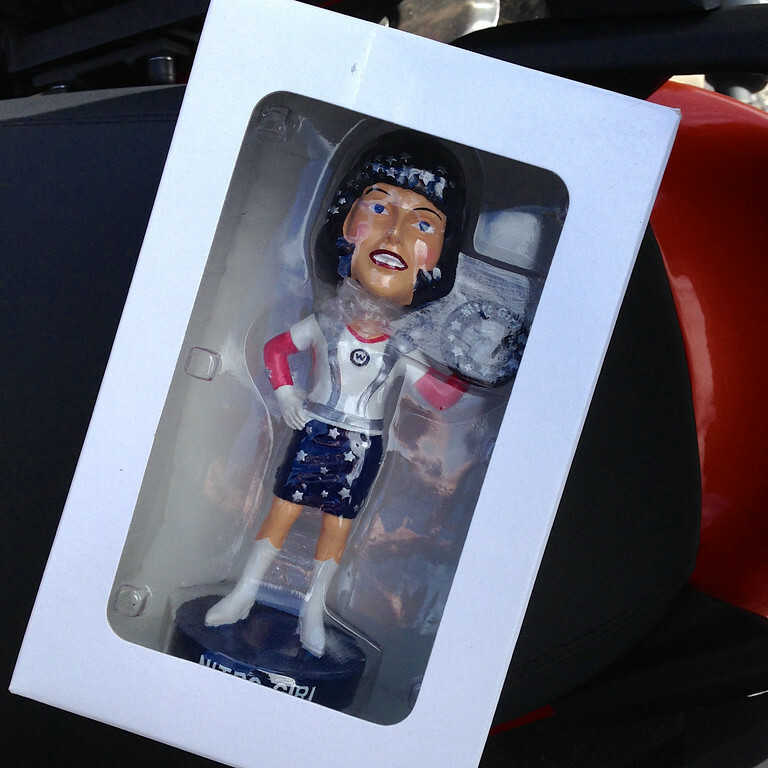 I visited Nitro Girl last spring, but, alas, it was a Sunday morning so no bobblehead for me. Color me green! People talk to me a bit when I’m on the bike, but nothing like back when I was riding a scooter regularly. I swear I could have been in the middle of the desert, 40 miles from anywhere, and someone would pop up to chat the second I stopped. On the bike, the people who talk to me are mostly just random women asking me to take them for a ride (I always politely decline). People stop to talk to me all the time – maybe because women riders are relatively rare in my neck of the woods. And, like you mentioned in your last blog, I love it when little girls take notice of me. I will stop to wave at, or talk to, any little kid who takes notice. I usually only get talked to when I am on my bike and it is usually about the bike. I am fine with people not talking while I am in the car. Socializing on a small scale is enough for moi. Its weird what happens when you are on your bike. I have people wave to me who aren’t riding. I also see a look of surprise when they look at me as I go buy in my diva red glasses under my helmet and realize I am a woman, I usually get a smile or wave or if I am stopped at a traffic light people will strike up a conversation. On a few occasions when I have been schlepping up to my office in all my gear in the elevator some people stare, others strike up a conversation and on a few occasions I have been told I am an inspiration. When I get a comment like that it makes me think hmmm, maybe I am the littlest bit cool! I am probably on that same end of the biker spectrum you are and I enjoy it every bit!